Why did the chickens lay the eggs? Because it stormed. We came home from meeting Ralph and Kathy Packard of Misty Meadows Farm yesterday with a dozen beautiful farm eggs in a range of shades of pink and brown. Brian commented immediately upon taking the carton that it was *heavy. * I had to test for myself of course and indeed it was heavy! 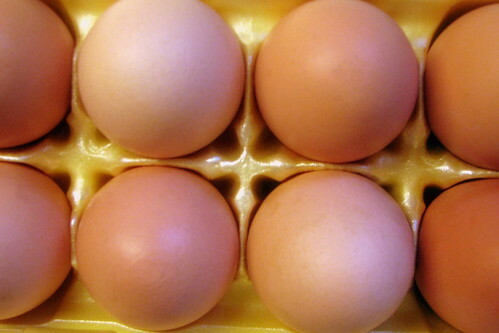 How could a dozen eggs feel so solid? My curiosity piqued, I emailed Kathy as soon as I got home with my first ignorant question about the workings of farms and nature. Here’s here reply. I think the eggs are heavier because the chickens are allowed to roam, and I do mean roam. They meet me at the door all the time. They aren’t raised in confinement like chickens that lay the store bought eggs. They get a chance to eat God’s natural goodness without the addition of hormones and antibiotics. We noticed that after the storm, our chickens laid eggs like crazy and they were enormous. We had many that wouldn’t fit into our biggest cartons. It’s like the storm scared the eggs out of them. Oh, the things I’m going to learn! ← I want to travel across oceans. I don’t want my food to. Oh Dana, thanks for sharing this inof! Yet another good thing about returning to Louisville that I can add to my blog! Don’t you wish you could ask Uncle Amos about the heavy eggs. Remember how he always gave you “a piece of useless information” that wasn’t really useless. I bet he would know. Call your grandpa and ask him about the egg weight. If he doesn’t know he’ll at least make up a good story to explain it. I’ve thought about doing this before. Do they deliver, come in town for pick-up, or do you have to go get? The eggs are heavier because they’re fresher! There’s a little pocket of air at the big end of the egg. And the egg shell is actually permeable to air, ‘cuz I think the chick’ll need oxygen as it grows eventually. In any case, as the egg sits on the store shelf, that pocket of air gets bigger. The inside of the egg is actually drying out. Hence, the way to tell if an egg is, indeed, fresh, is to put it in a bowl of water to see if it stands on end. If it’s really old, it will actually float. Nice blogging, btw. I wish one of our CSA members would do something similar!